What do mean you haven’t seen this masterpiece yet?! OK, he didn’t personally help me propose. However, my whole scheme for being unique was based on his cult classic 1989 movie UHF. It was December 29, 2002. Amanda was staying at my parents house to visit for Christmas and the new year. I’d arranged for my parents to conveniently decide to go see a movie and leave us alone at the house. Once they’d left, I told Amanda I was really in the mood to watch UHF. My whole plan almost completely fell off the rails at that moment. Somehow (I don’t remember how) I managed to convince her to humor me. Eventually, a mock commercial for Spatula City came on during the movie. Family opening presents around Christmas tree – kids hug parents. Don’t forget… they make great Christmas presents! (Soft focus) Man hands spatula with bow to woman over candlelit dinner. (hushed v.o.) 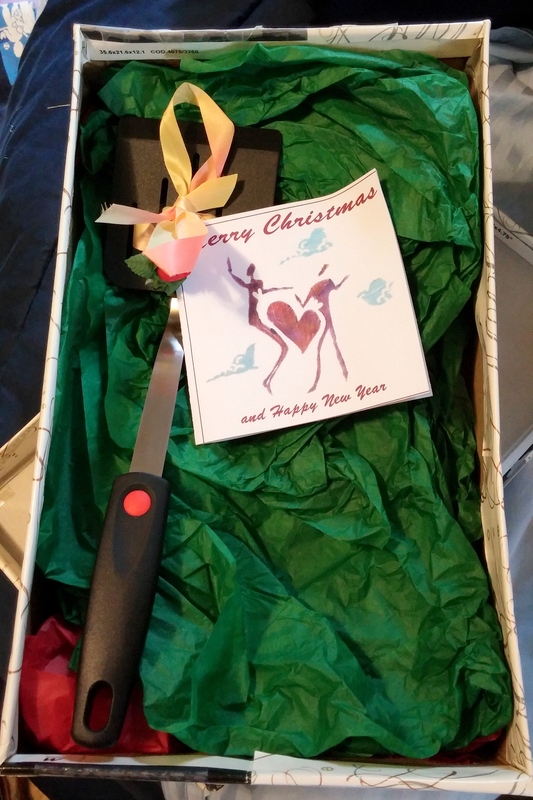 And what better way to say ‘I Love You’ than with the gift of a spatula…? At that moment, I paused the DVD and pretended to suddenly remember that I had another Christmas present for her. I pulled out a shoe box that I’d wrapped in nice paper (box and lid separately) and handed it to her. What better way to say “I love you” than with a spatula? Inside the box she found a brand new spatula. 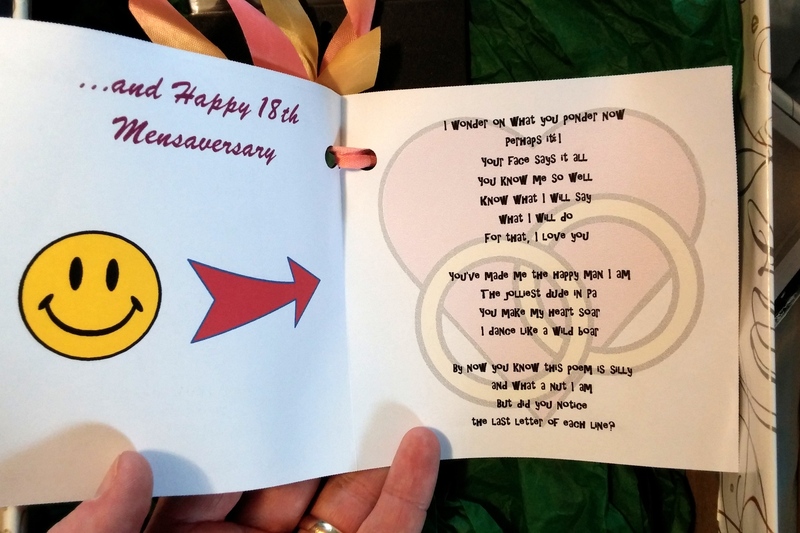 Attached by a ribbon, there was a card made from a CD insert, using cover design software. On the inside of the card was a silly poem I’d written. I wonder on what you ponder now. Your face says it all. For that, I love you. The jolliest dude in PA. I dance like a wild boar. And what a nut I am. The last letter of each line? I sat in agonizing, impatient silence, watching and waiting for her to notice that the last letter of each line spelled out “Will you marry me?”. 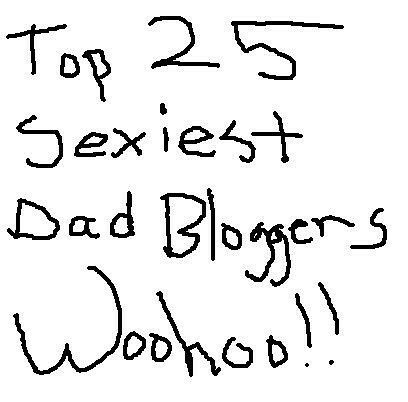 As she read, I pulled something out of a hiding spot. It was a small wooden box I’d bought at Michael’s and stained. I’d filled it with cotton and placed my grandmother’s engagement ring on top. I held the ring box in my hand and waited. She had a lost and confused look on her face. She wasn’t getting it. I suggested that she read it again. As she did, I pulled out the box I’d been secretly clutching. I got down on one knee in front of her, opened the box to reveal the ring to her, and asked her if she would marry me. In some of the longest seconds of my life, I waited some more as she reacted. As the words sank in, she began to cry. “Those are happy tears, right?”, I asked. “Yes”, she said. Only you would use Weird Al….